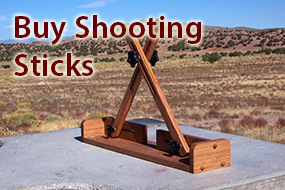 Cat’s Shooting Sticks are individually hand crafted from solid oak, or walnut, 1×2’s. 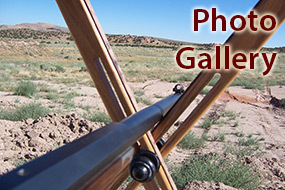 A 3/8 inch wide leather strip on each stick protects the finish of the rifle barrel, and helps hold the rifle barrel in position. Unlike other sticks, these are easily adjustable, with very little effort, to accommodate your specific shooting “comfort zone”. You will love the “quick and easy slide adjust” to your perfect height with simple clamp knobs. No predetermined adjustment holes in the wood or leather “cradles”. 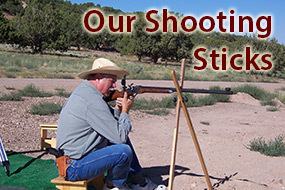 The craftsmanship and specifications for these sticks comply with NRA, SASS, and BPCR Rules. In addition to our traditional spikes, WE HAVE ADDED A NEW FEATURE TO OUR PRODUCT LINE!!! THESE NEW CROSS STICKS HAVE STEEL BLADES PINNED INTO GROOVES, INSTEAD OF THE SPIKES, INSURING A STABLE SHOOTING POSITION. LEATHER SLIDES TO PROTECT THE BARREL ARE INCLUDED. We still offer our traditional Buffalo cross sticks with the spike and leather strips at a lower cost. Phone orders are accepted at anytime. Visa & MasterCard accepted .